DETROIT -- Delphi Automotive LLP agreed to buy back an equity stake from former parent General Motors Co. for $3.8 billion to simplify its capital structure. Delphi also is acquiring the Pension Benefit Guaranty Corp.'s ownership stake for $594 million, the Troy, Michigan,-based auto parts supplier said Thursday in a statement. Delphi, which generates the majority of its sales in Europe, will use cash and a portion of a credit line to fund the purchases, according to the statement. Delphi, once the largest U.S. partsmaker, in October 2009 exited an almost four-year restructuring that resulted in four classes of shares. Lenders including private equity firms Elliott Management Corp. and Silver Point Capital LP bought most of the original Delphi and still hold a controlling interest. 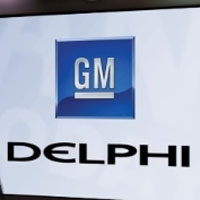 "Delphi would want to get rid of any outside stakeholders if they want to go public again, and GM would rather have the cash than the Delphi interest sitting on their balance sheet," David Whiston, an equity analyst with Morningstar Inc. in Chicago, said in a telephone interview. GM will book a gain of about $1.6 billion in the first quarter related to the sale, according to a statement on its Web site. Proceeds from Detroit-based GM's sale will be used for general corporate purposes and haven't been earmarked for a specific use, Jim Cain, a spokesman, said in a telephone interview. Delphi is using available cash and $2.5 billion of a $3 billion credit line provided by JPMorgan Chase & Co. for the transaction. Delphi reported profit of $631 million last year on revenue of $13.8 billion. The company held cash and cash equivalents of $3.22 billion as of Dec. 31. "These transactions represent an important step in positioning Delphi to continue to increase shareholder value," Delphi CEO Rodney O'Neal said in the statement. "We continue to have significant financial flexibility and remain committed to pursuing opportunities that drive value creation." While the sale removes GM from Delphi's capital structure, there will be no change in their commercial relationship, Cain said. GM represented 21 percent of Delphi's sales last year, down from 54 percent in 2004. GM earlier this month sold $1.02 billion of perpetual preferred stock in former finance arm Ally Financial Inc. that will result in a book gain of about $300 million in the first quarter, GM said today. GM probably will use "at least a good chunk of the cash" from the two sales to help fund its U.S. pension, which was underfunded by about $11.5 billion as of Dec. 31, Morningstar's Whiston said. Lenders including New York-based Elliott and Greenwich, Connecticut,-based Silver Point won an auction for Delphi in July 2009 by bidding the value of debt they were owed by the parts supplier. The loans totaled $3.3 billion, according to court documents. Delphi's Chapter 11 filing in October 2005 was the biggest U.S. auto-related bankruptcy at that time. The PBGC in 2009 agreed to take over retirement plans covering 70,000 Delphi workers and retirees. The federal insurer has taken responsibility for $6.1 billion of Delphi's pension plan that was underfunded by about $7 billion, the organization said today in an e-mailed statement. The PBGC said the loss is the second-largest in the agency's 36-year history. "PBGC doesn't know how this action will affect benefits," the organization said. "PBGC will inform Delphi retirees of their final benefit amount as soon as the complex calculation process is complete." GM's class of shares in Delphi was valued at $2.08 billion as of Dec. 31, according to Delphi's year-end financial statement on its website. The Class C membership interest, which was held by the PBGC, was valued by Delphi at $646 million at that time, according to the statement. Delphi's purchase price of GM's stake was 83 percent higher than Delphi's valuation of the membership interest at the end of last year. Delphi bought the PBGC's stake for 8 percent less than the interest was valued at on Dec. 31. The PBGC's stake in Delphi was managed by JPMorgan, which negotiated the sale, J. Jioni Palmer, a spokeswoman for the Washington-based agency, said in an e-mailed statement. "JPMorgan operates under PBGC oversight and works to obtain the best possible value in the market for PBGC assets, including those that like the Delphi interest are hard to value and harder to sell," Palmer said in the e-mail. Joseph Evangelisti, a JPMorgan spokesman, declined to comment. The PBGC is a federal corporation created by Congress in 1974 to protect pension programs of bankrupt companies. The agency, which guarantees the retirement plans of 44 million Americans, reported a deficit of $23 billion as of Sept. 30. Delphi ranks No. 9 on the Automotive News Europe list of the top 100 global suppliers, with sales to automakers of $11.76 billion in 2009. Of that total, Europe accounted for 42 percent.